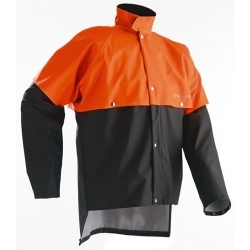 Rain jacket made of strong nylon and a yoke of PU/PVC. Mesh material under the yoke that provides for good ventilation. A well-protected breast pocket with zip under the yoke. Welded seams. 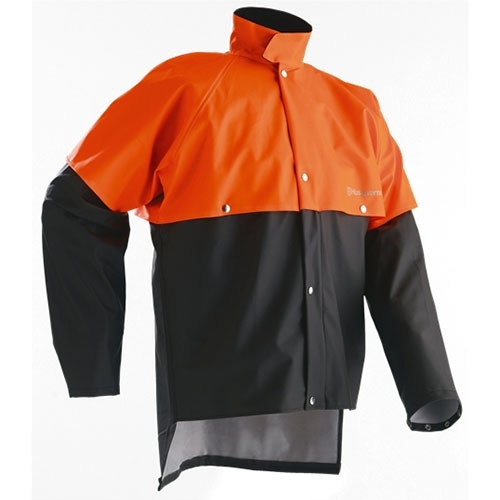 The jacket has extra long sleeves with press studs and an extended back with rain lip. Corduroy collar with Velcro closure and a long zip protected by a flap with press studs at the front.